On 1 January 2016, APL ushered in the New Year with its U.S-flagged vessel, APL Guam arriving at the island of Guam for the first time. The event marks the maiden inbound shipment to Guam via APL’s Guam Saipan Express (GSX) service. Designed primarily to give Guam and Saipan shippers an alternative option for shipments from the U.S. mainland to these markets and vice versa, the GSX service connects with APL’s weekly U.S.-flagged Eagle Express service (EX1) in both Yokohama, Japan and Busan, South Korea. Prior to calling Guam, the 1,100-TEU APL vessel made its first call to Saipan. 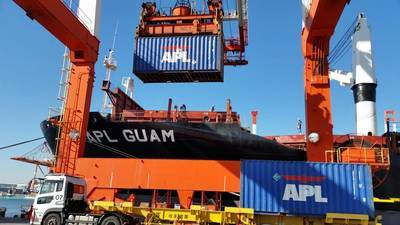 Upon returning to Yokohama, APL Guam will begin its regular two-week rotation, calling Guam, Saipan, Busan and Yokohama on Saturday, Sunday, Thursday and Tuesday respectively. In particular, the fortnightly GSX service is scheduled for weekend arrivals for ready cargo availability on Monday mornings in both Guam and Saipan.